We often accept our snoring﻿ (or our partner’s snoring) as simply an irksome habit. However, in many cases snoring is actually a symptom of a potentially dangerous underlying disorder: sleep apnea. The effects of sleep apnea reach far beyond restless nights, and there is growing evidence that — left untreated — this disorder has a significant negative impact on your overall health. If you suspect that you or a loved one is suffering from sleep apnea, get the facts and learn what steps to take to get treatment. Sleep apnea is a common sleep disorder that makes you to experience repeated pauses in your breathing, or extremely shallow breathing while you’re asleep. Over the course of a night, someone with sleep apnea can experience as many as 30 of these breathing episodes per hour. The episodes are often followed by a loud snort or choking sound, after which your breathing returns to normal. Cases of sleep apnea can be divided into three categories based on what is the source of your nighttime breathing trouble. Obstructive sleep apnea is the most common form of this disorder and is caused by excessive relaxation of the throat muscles.The muscles in the back of your throat are responsible for supporting the surrounding soft tissues (like your uvula, tonsils and walls of your throat). When they relax too much they can cause these soft tissues to fall inwards, narrowing your airway and making it difficult to catch your breath. Central sleep apnea is more rare and is due to a disorder in communication between the brain and the muscles which control breathing. Unlike in obstructive sleep apnea, people with central sleep apnea do not struggle to breathe but rather have periods wherein their body simply stops breathing entirely. Complex sleep apnea is the term used when someone suffers from both obstructive and central sleep apnea simultaneously. This form of the disorder is the trickiest to treat.It can be difficult to determine what type of sleep apnea you are suffering from; but discovering the source is absolutely essential to properly treat the disorder. Snoring: Very loud snoring is often the most apparent sign you may have sleep apnea, and is more often associated with the obstructive type. Pauses in breathing: These episodes of breath arrestation often go unnoticed by the sufferer themselves and instead require a witness to draw them to your attention. Sudden awakening: A pause in breathing may cause you to wake up suddenly. If you awaken feeling short of breath you are more likely to be suffering from central sleep apnea. Dry mouth or sore throat: The combination of snoring and gasping for breath associated with sleep apnea can dry out your mouth and throat. Headache: Breathing troubles may also cause you to wake up in the morning with a throbbing headache due to high levels of carbon dioxide in your blood. Insomnia: Similar to experiencing sudden awakenings, some sleep apnea sufferers may experience difficulty staying asleep, and falling back to sleep. Hypersomnia: Since sleep apnea affects the quality of your sleep, you may experience excessive daytime sleepiness. Attention & memory problems: A lack of sleep is known to negatively impact your ability to concentrate and retain new information. Certain factors put you at a greater risk for developing sleep apnea. While some of these factors are unavoidable (you can’t turn back your age), others can be dealt with by making lifestyle changes (such as dieting to lose weight). Some people develop central sleep apnea when first using continuous positive airway pressure (CPAP) machine to treat their obstructive sleep apnea. This is the leading cause of complex sleep apnea and often goes away with continued CPAP use. Additionally, being chronically sleep deprived can increase your chances of being involved in a work-related or driving accident. 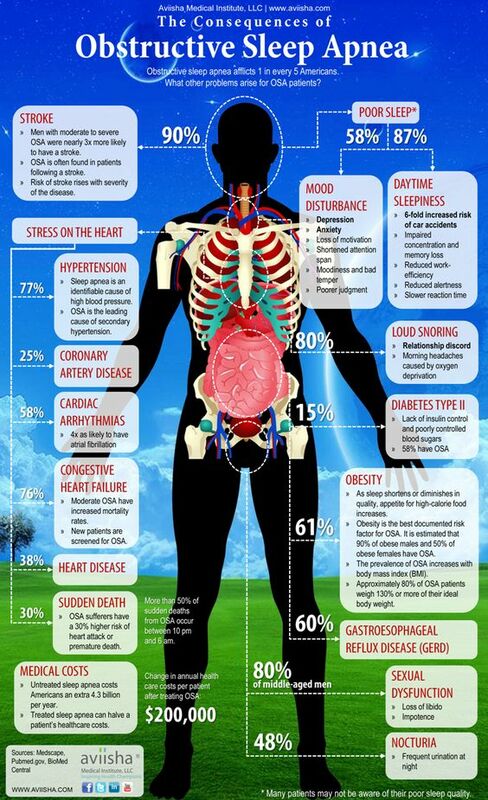 For these reasons it’s extremely important to talk to your doctor if you suspect you may be suffering from sleep apnea. While the impact on your daily activities may seem small at first, the long term consequences are not worth delaying treatment. Snoring so loud that you wake those around you. Waking up suddenly with shortness of breath, gasping or choking. Falling asleep during normal daytime activities. If you’ve decided it’s a good idea to have your symptoms checked by your doctor, here’s what you can expect from your visit. To make the most out of your time with your doctor, it’s a great idea to come prepared with a list of any medications you take and answers to some basic questions that may help determine your diagnosis. What to expect from a Physical Exam? Your doctor will perform a basic physical exam, and may run some basic lab tests to check for any underlying conditions or infections that may be to blame for your symptoms. Your doctor will then ask you question to gain a better understanding of your symptoms, which will guide them in diagnosing you. Are your symptoms continuous, or do they come and go? Do you stop breathing during sleep? If yes, how many times a night? Does anything help your symptoms? Nocturnal Polysomnography: This is a very comprehensive sleep test conducted at a specialized lab. While you sleep a variety of equipment will monitor the activity of your heart, lungs and brain; as well as keep track of your breathing patterns, oxygen levels, and the movements of your limbs. Home Sleep Tests: While an in-lab polysomnography is the gold standard of sleep apnea diagnosis, It’s not always necessary to spend a night at a sleep lab: your doctor can send you home with a device to measure your oxygen level, heart rate, airflow and breathing patterns. These tests generate a large amount of data, which is used to calculate specific parameters which offer insight into your sleep disorder. Objective measures that you may find differ significantly from your self-reported. For instance, many people with sleep apnea greatly overestimate the amount of sleep they are getting each night. Most importantly for a diagnosis of sleep apnea, your apnea-hypopnea index (AHI) will be calculated. Your AHI is the number of apneas and/or hypopneas you experience per hour as you sleep. Apnea: A complete cessation of breathing, lasting 10 seconds or longer. Hypopnea: A constricted breath which lasts 10 seconds or longer. Some cases of sleep apnea may resolve themselves if you make certain lifestyle changes. Even if they do not completely eliminate your symptoms, incorporating some of these changes can help you get some relief while awaiting treatment. Moderate to severe sleep apnea often requires the use of specialized medical devices to improve airflow as you sleep. CPAP helps relieve sleep apnea by delivering air pressure through a mask placed over your nose, which helps prevent your airway from collapsing. Getting used to sleeping with CPAP can be difficult at first, but the majority of people are able to adjust by playing with the tension of the straps, or trying alternate styles of mask. If you feel that you’ve tried everything and are still experiencing discomfort, or if you’re still snoring with CPAP on, talk to your doctor. It’s important that you do not stop using CPAP without first consulting a medical professional. If CPAP continues to cause issues for you, your doctor may suggest using an alternate air pressure device. Auto-CPAP: Automatically adjusts air pressure as your are sleeping. BiPap: Provide two different levels of air pressure: more when you inhale, and less when you exhale. Oral appliances can be worn to help keep your airway open; such as by gently bringing the jaw forward, preventing your throat from relaxing. You can purchase one of these devices from your dentist; and you might have to try a variety before finding the one that works best for you. Once you get the right fit, you’ll have to continue to follow up with your dentist over the course of a year to make sure it’s providing the best relief. Surgery should always be kept as a last resort solution. As with any surgical intervention, surgery for sleep apnea comes along with its own risks and side-effects. However, severe sleep apnea can itself be life-threatening, and if other conservative treatments are not effective surgery may be necessary. Tissue Removal: During uvulopalatopharyngoplasty some of the soft tissues are removed from the back of the throat. This often includes the tonsils and adenoids. Jaw Repositioning: Much like oral appliances, maxillomandibular advancement can be used to permanently move your jaw forward. This makes obstruction less likely to occur by increasing the space behind your tongue. Developed by Washington University, ApneaApp turns your smartphone into an effective sleep study tool. The app uses sonar technology to monitor the movements of your chest and abdomen to determine breathing patterns as you sleep. 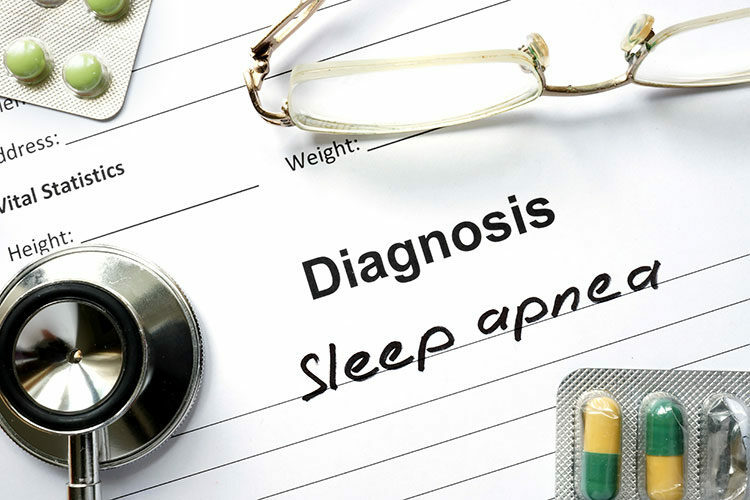 While not a replacement for polysomnography, ApneaApp has been used in an experimental setting to detect obstructive apnea, central apnea and hypopnea. Living with sleep apnea comes along with its own set of difficulties and frustrations. Even after receiving your diagnosis, it can take weeks of trial-and-error before you find a treatment that works for you. When times get tough, communicating with people going through the same thing as you can help relieve feelings of isolation. A.W.A.K.E: The American Sleep Apnea Association has a mandate to provide patients with access to a wide range of resources, such as publications and informative videos. Additionally, they can put you in touch with a local sleep apnea support group. CPAP Talk: One of the largest sleep apnea forums, CPAP Talk has over 40,000 active participants sharing their personal stories, answering questions and providing support to one another. The forum is 100% free to use and is a great place for newly diagnosed people to reach out.